It was a very hot day and although the last place you want to be in LA is the Valley, that is exactly where my business took me. I was aiming to make the most of my Wednesday off, grabbing a burger and serving it with a Bordeaux at my buddies place. On the agenda was Bill’s Hamburgers, a tiny shack with some serious history, located off Oxnard Street in Van Nuys. The burgery was charmingly petite, dedicated to its craft, the kind of unassuming place that had been griddling quality patties for years. Keeping things simple, the menu was sparse and dining space… intimate. No sides to speak of, no baskets of fries, except, they did vend bags of potato chips, bringing to mind Hinano Cafe—a great bar burger—in Venice without a deep fryer. I had to get my fixings somewhere else and on the bar-like seating I spied a large jar of pickled jalapeños, enough to accompany each bite of burger if I were so inclined—two sufficed. We made our orders to go, for the following: double cheeseburger and a hamburger. Before our eyes we watched the griddle master set to work, toasting the buns searing the patties and administering a generous sprinkle of seasoning (Salt ‘n Pepper). We were out the door, with peppers in hand for roughly eight dollars. Once back inside the air-conditioned domain of my friend, I poured the contents of the already-decanted*-Bordeaux into our beakers and readied our burgers for the camera. Burger to makeup! They were small and densely packed with a standard accompaniment of veggies and spread. There were no surprises and I was not disappointed, unlike the many gourmet burgers that needlessly overcomplicate things—simplicity reigns supreme. My hamburger was solid and it paired well with the Haut-Medoc (#175). 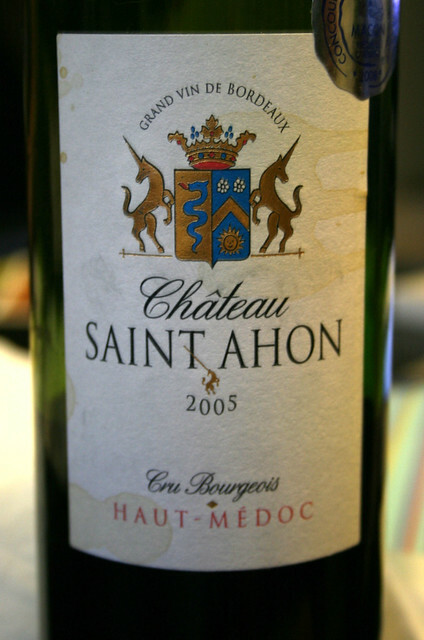 The 2005 Château Saint Ahon shown an opaque ruby in the glass with a powerful fragrance of dried red flower petals, leather and blackberry pie on the nose. The dry red had a kiss of blackberry but most of the fruit on the nose had disappeared and we were left with earthy, secondary flavors deep in the mouth and nice coating of fine and soft tannins and a medium finish. It did well to work harmoniously with the sandwich, not upstaging the classic California burger but to complement it subtly. Despite the unremitting heat of the Valley and the stuffy drive back down the 405 I was content, not so much on portion size—next time I will order two burgers—but on flavor and quality. Bill’s Hamburgers lived up to the praise as a bona fide burgery. I was thankful my buddy insisted on it.